The answer is no, but I'm finding that if I don't start My Monday Morning Coffee piece on Friday, it doesn't get finished. I woke up yesterday and said "Oh crap" and got typing, almost got it finished, then got up this morning, realized I'd forgotten that I had to take my cousin to work (sorry Mike) and was going to be late for my own job. Things are a little off-kilter here in FR Land right now, and will be for a few weeks yet. My grandmother is dying of cancer, she's 90, and it won't be long now. She has been an anchor for this family for a long time, and one of the steadiest parts of my life. I'm also trying to wrap up my current job and working long hours and weeks. I know, you all have jobs, you don't need to hear it. But it does absorb a lot of my energy and time. I want to give special thanks to Robert Vaughan and Brian Kozminski for their fierce loyalty to my Monday Morning Coffee piece. And Sanders, who contributed a cup. So, as I've threatened a few times here, it may remain sporadic here at Fontinalis Rising. All is not lost. I have some projects and trips in the pipeline that I'm very excited about. Cameron Mortenson from The Fiberglass Manifesto is on his way to Michigan, and rumor has it we may get some fishing in. I'll be doing some "research" soon on hopper fishing. I have two huge trips coming up later in the year that should be epic. And there is still so much to get to here in Michigan. Brookies on the Upper Tahq, Sultry Summer Largemouth, Pepto Pike and night fishing for browns. September will kick off my bid for the King(s)! I'll leave you with some photos from the weekend. I went out without hope, I came back inspired. Blissful. Sublimely happy. I'll mostly say this with pictures. There's one video down there- I posted it because the footage is better than the photos. I was supposed to work this day (Saturday June 18) but I had a backlog of things that had to get done, which took all of the morning, so I texted my customer to let him know I'd come Sunday, finished my work about 1:30 in the afternoon, loaded my kayak and gear, and pointed the truck north, back to Sturgeon Bay on Lake Michigan. When I got there, the wind was howling at a steady 25 mph, with gusts, but the sun was shining, the day was beautiful, and the water beckoned. I had barely gotten started up the coast when I started seeing carp- dozens of them, 200 or more on the first flat I came to. I was unable to hook up on carp, but did manage one smallmouth, and so I fished out the camera. I spooked the carp off shore with my wild casting in that wind, managed to hook my own caboose, and so went further up the coast to find fish. At my next stop I found this one. Just a random spot on the shore, nothing special, but I was eyeing a large rock a little ways up near a reef and caught three more smallmouth. ever try to shoot action, while fighting the fish? When I returned to the kayak, the wind had blown my paddle away and it was only this rock that saved it. From here I paddled all the way to the cut, where Wilderness point ends and Waugoshaunce Island begins. I paddled to a small rocky islet and cast around. Here's what I came up with. That's right, my first carp on the fly. Here's video of me landing it, as the quality is a lot better than the photos I took. I have to say that this fish was not particularly "hot", I did not see my backing. He took most of my fly line, but I actually hooked up in deeper water, about six feet, and because it was the deepest spot for some distance around I don't think he wanted to leave it. The fish I spooked on the flats took off much faster than this fish, so I'm not giving up on the "golden bone" dream. It was a lovely day, with awesome scenery and fantastic fishing despite the wind. I probably saw upwards of 500 carp in huge shifting schools or small bands. The sea birds, the eagles, the sky and water all combine for a memorable experience. It really is a dream destination, and only 30 minutes from my house. This was my first time paddling out that far, and it was amazing how different the geology and water conditions were from the rest of the area I live in. As the sun began to drop and the sight fishing got tougher, I ate my dinner on my little islet, tried for those carp again, then started the hour long paddle back to the truck. I could see a storm pounding its way across the U.P. and hoped it would miss me or hold off until I got home. I'll definitely be going back soon to fish the waters around the island. The satellite views show it to be as big as the point itself, with even more extensive reefs and flats. The rivers are blown out right now from a week of rain, so this may be the best option anyways. I'll let you know how it goes. It's done. All the weeks of planning, planing, sanding, cutting, glass and epoxy work. LOOK at this boat. I think I'll have to mostly say it with pictures. Phil has had it out on the water already. He says it draws about 2.5 inches- imagine that on your favorite trout stream. He improved the rocker and chine characteristics of the boat and says it spins on a dime. Three seats (he plans on using this as his main guide boat.) Notice the fitted rubber mats that keep you from standing in water and are comfortable and slip resistant. Check out this detail on the side. Phil's wife Trude is a local artist whose work is very popular here. If you'd like to see more you can visit her website. I'm sure she'd get a following among us fly anglers if she painted more fish like this one, but I think she may be happy with the niche she's in. I have a Trude Bigelow painting hanging in my living room and love it. Everything about this boat is beautiful and well thought out. 3 seats, dry storage, rod tubes. The hull is LineX and Kevlar. The artistry is amazing, with curves everywhere that compliment the overall design and scream "I belong on the water!". Or maybe hung on a wall somewhere. Check out the anchor stanchion- walnut. Mmm, mmm. Love it. These boats are not mass produced- Phil builds them one at a time, by hand. If you're interested in having him build you one, contact him- all the information will be listed below. He'll be more than happy to work with you on custom designed boat just for you. I've spent a lot of time in Phil's boats and can vouch that they handle well, are very shallow draft and tough- you'll probably never put them through what we do. If you love wooden boats or have always wanted a wooden drift boat make sure you get a-hold of him. I'll be spending some time in this boat, I can assure you, and it will probably appear on a regular basis here as time goes on. I can't wait. I'm laying face down in the mud, my body wracked with pain, the weight of my pack seeming to push me further in. I'm nearly blacking out from the pain. I hear footsteps, and shouting. My friends heard me fall. Help is on the way. They pull my pack off and roll me over. I can remember questions, just not what they were. I'm on the verge of passing out. I really should have told them. What I had neglected to tell my friends, was that this morning I had fallen outside of our base camp and pulled a quad. The pain at the time was excruciating, but what could I do? We had driven 1500 miles, planned for how long, fretted and packed, wheedled our spouses and kids and girlfriends, finagled our jobs and bosses, for this trip. And now I was lying in a muddy drainage, at 10,000 plus feet with an injured leg? I've always been able to walk it off, push through, drop a shoulder and make an opening. This had NEVER happened to me. Now, seated in the grass, grimacing in pain, there was no hiding it. I fully expected the trip to be off, for us to camp there and hike back out in the morning. I was wrong. What we did, foolishly, was soldier on. My right leg was useless. I could walk after half an hour, barely, with the aid of my trekking pole. So Braxton and Sawyer were assigned to ferry my pack. Fast forward. 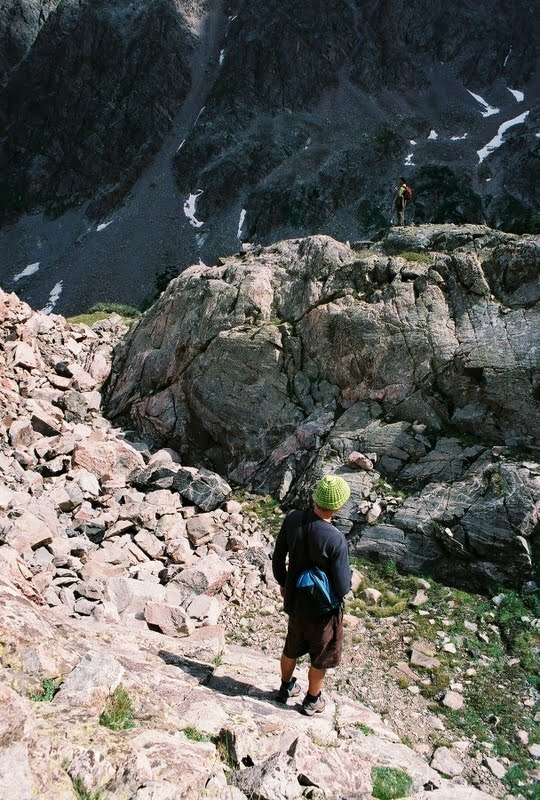 I'm high on a scree slope. Really it's an avalanche chute. Why is it so much easier to quarter uphill on mountains? I'm high above the valley floor, and the altimeter on my GPS says 10,800 feet. Down below me I can hear Keith. After working his way up toward me, and me angling down to him, we meet. Keith is gassed. " I can't ever do this again" he says. " I don't understand it". I do. 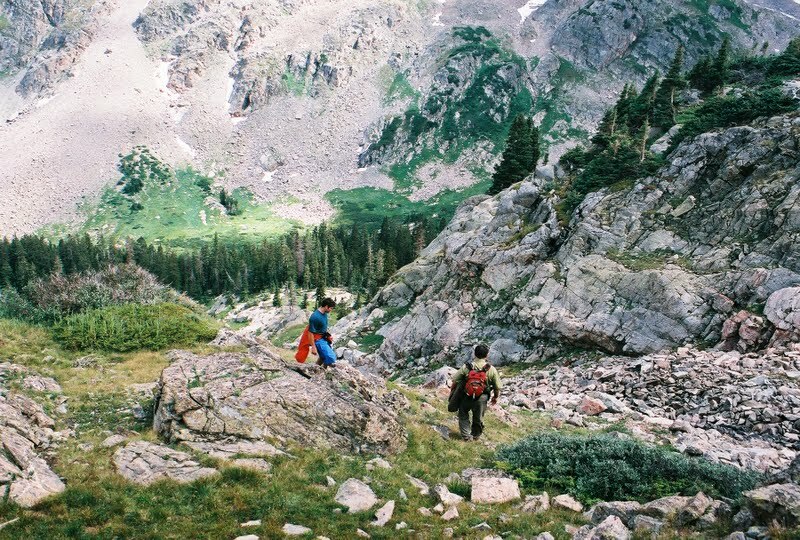 We're in our late thirties, we've hiked 2,000 vertical feet wearing 60 pound packs for the last ten hours, and the paucity of oxygen is kicking our cans. We push on. The Walsh brothers have already made one lap. Keith and I have seen no sign of them. We finally top out on a house-sized granite escarpment, and then... the pain is gone. 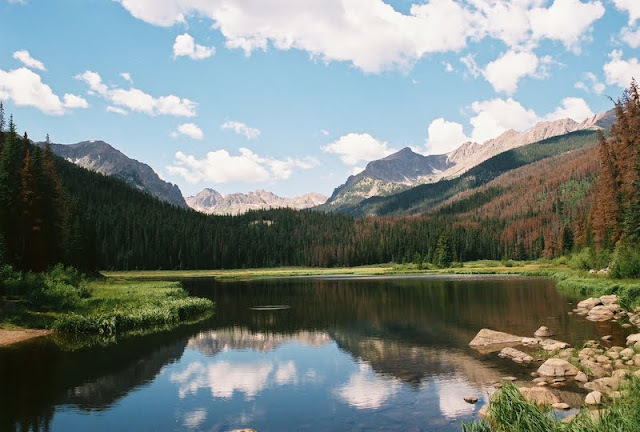 There is a beautiful lake, calm, surrounded by peaks. We've made it. That reverie didn't last long. The light was dropping fast. Keith and I set up camp, silently, ears straining for any sound of our friends. The last 500 vertical feet of the canyon we've come up are the crux of this hike, steep, filled with avalanche chutes and choked with boulders. After my experience coming up, my fear is that darkness will catch them on one of those avalanche chutes. I can't imagine the terror and discomfort of a night spent on those rocks. Just when the light is failing, we hear footsteps. They're back, safe. That's all that matters. We ate a quiet and hurried dinner- we were all exhausted, and turned in for the evening. Our sleep was punctuated by something going bump in the night- it turned out to be the largest porcupine I had ever seen, chewing on Keiths pack. Other than that I slept well, and as usual awoke before everyone the following morning. I rolled out that morning, grimacing in pain. I made my coffee and popped some ibuprofen. My first aid kit consists of hockey tape and ibuprofen. Whatever happens to you in the outdoors can either be treated by those two items, or you need to be airlifted. I wandered down to the edge of this beautiful lake we were camped on. It was late August, but dirty snowfields wrapped one side, the rest ringed by darkly green spruce and lodgepole forest, the lake itself a shimmering blue green, surrounded by an amphitheater of Rocky Mountain peaks, and there, right in front of me, cruising slowly, are two cutthroat trout, one green, the other a garish red, both highly speckled. I hurried back to camp as much as one can with a bum leg. I set up my new 5 weight travel rod, tied on some sort of wet fly- was it a Mickey Finn? and went back. Two trout, about 15 inches long are cruising toward me. I cast about 5 feet in front of them, and the race is on. In another moment I'm holding my first ever cutthroat trout- green back, red sides, heavily peppered, fat- one of the most beautiful things I've ever seen. I quickly released it and moved on. I caught a couple of more fish before breakfast, but hurried back to camp when I heard movement. After breakfast I crossed the creek to the adjacent beach. The lake was dead calm, the water very clear, and everywhere I looked cutthroat were cruising, singly or in pairs. I caught a couple more fish, but most swam past my fly without looking, or rushed towards it and then veered off at the last moment. After a few fly changes I tied on a small white gnat of some sort and got consistent success. This day was one of the most magical I've ever experienced. I'm gasping for oxygen at this altitude- 11,300 feet, surrounded by gorgeous vertical peaks. Everything smells of water, spruce and moss. The sun is shining, I'm catching dozens of fish of a new species. What do you do in a situation like this- stare at the peaks, stare at the beautiful lake, or go hog wild on the fish? I slowly made my way around the lake that day, my progress made slower by my painful leg. About halfway around I switched to a black gnat, and this was what they were looking for. I went from hooking up on every tenth cast, to hooking up on every cast. It was right after this that puffy, innocent looking clouds drifted in and lightning rocked, the thunder rolled, the rain poured, and I was trapped under a particularly dense spruce, awaiting the storms passage. When it subsided I made my way back to camp. We ate dinner together- trout was on the menu. Keith had caught some just for the occasion. It was- delicious. We had waited an extra hour for dinner, as the passing storms had created a downdraft, the lake we were camped on was situated at the neck of a vast funnel of peaks. After the rain abated, the wind blew 60 miles per hour, for about half an hour. I live on the Great Lakes, I know my wind speed. It was fierce. 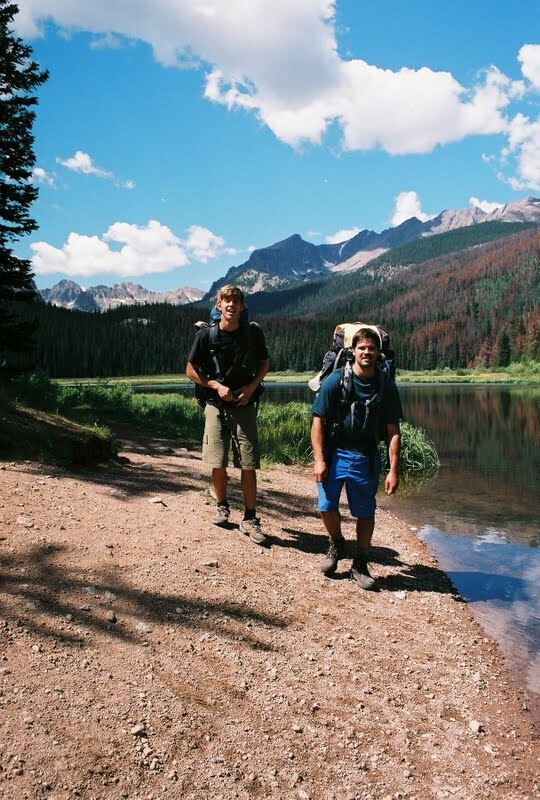 The Walsh brothers- Braxton and Sawyer, had hiked 1000 feet up to another, smaller lake, and over dinner they decided to share a revelation. "We found some kind of den, with piles of poop, and all kinds of bones, and half eaten deer and elk". This kind of announcement at dinner tends to end other conversation. "Where was it?" I asked. "Right there, under those rocks", said Sawyer. "Right there? Or up there by the lake?" The rocks in question were three hundred yards away. There was a lion in camp. It changed the dynamic of the trip. For instance, that night when I felt certain urges, I fought them as long as possible, lost some sleep over it, and only ventured out when I could take it no longer. The next morning when I crossed the creek to fish at the wide beach I no longer felt comfortable- I was now only 225 yards from the den. Was this thing watching us? Would a mountain lion recognize that I was limping? I was after all the weak one in camp, the straggler. They pick off the weak and injured, right? Braxton had been distinctly unwell- mild nausea and headache- classic altitude sickness (again, my fault, as it was likely brought on by the extra exertion from ferrying my pack). But my leg was feeling better, and part of the plan had been to cross over the top of this drainage, at 13,800 feet, and into the next one and back down to where we had started. 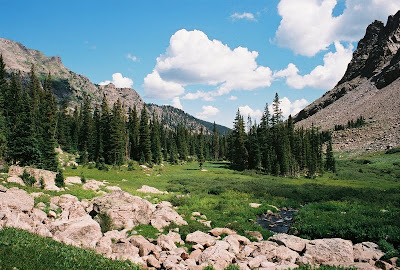 So this day we decided to hike up the creek feeding the lake and and see if we could top out on the ridge. It was an incredible hike, with fantastic views, another gorgeous lake, and cutthroat in the creek, but in the end none of us made it to the top. Braxton was too sick, my leg was too sore, and the altitude, the verticality of it all, and sheer fatigue got me. Keith and Sawyer made it a little further up, but when puffy clouds again drifted in we made our way back down, through these amazing green chutes, across awesome rocky abutments, descending 2,000 feet back to camp, just as the next storm struck. That evening the wind blew 70 miles per hour, and it did not let up for 2 hours. We finally huddled behind a large boulder and made our dinners, but the conversation was muted- we couldn't hear each other. A tree actually blew over in camp while we ate dinner. It all came to a head then- my leg, Braxton's altitude sickness, the wind, and the unspoken fear of that creepy den just up the hill. When I had fished that morning, I continually looked over my shoulder. We all felt it, as if the mountain itself didn't want us there. We decided over dinner to end our trip early and head down the next morning. Why was this the greatest trout fishing trip of my life? Because it had it all- a classic road trip, the camaraderie of friends, danger, pain and hardship, a team working together for a common goal, fear and false alarms (the porcupine came back and woke us up that last night as well), but above all, I remember those fish. They were beautiful, fat, and healthy, protected by their Rocky Mountain fastness. This trip was about more than trout fishing, it was about living dreams, discovering yourself and learning what me and my friends were made of. Those trout are relatively safe up there- I know that if I go back, it will be relatively the same. No one will ever pave a road up to there. Most streams don't have that advantage. I've done a little work this spring with the local Trout Unlimited chapter doing bank restoration. Just a handful of volunteers, a couple of hundred tree seedling and some grass seed. When I first fished that spot it was sand all the way to the rivers edge, but there's a firm berm of grass growing there now from past efforts. That's all it takes. 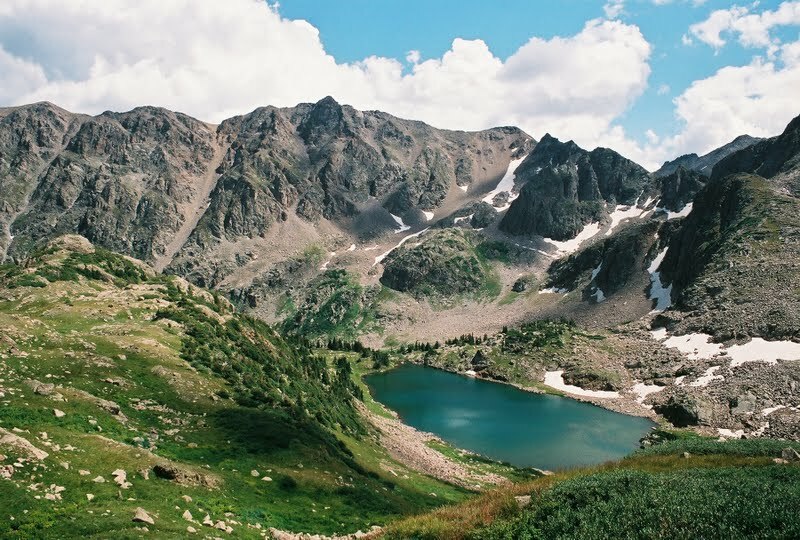 That lake, high in the Rockies, has it's remoteness, the altitude, a whole forest of boulders to protect it. The rest of the waters in Trout Country need Trout Unlimited. We need this, I need this- water that soothes and comforts, water full of native fish, a pristine environment that we can melt into. Whether it's a death march up a mountain to challenge ourselves, or a relaxing evening on the river, we need Trout Country, and all that that entails. We need Trout Unlimited. I say that as a proud Michigander. I say that as a fly angler. I say it as a human being. We hiked out the next morning. It only took six hours. Braxton felt better immediately, thus confirming my suspicions of altitude sickness. The rest of the trip was amazing- new friends and new adventures. I'm still in contact with the friends I made on that trip. I want to go back- badly. But we can't ever go back really can we. Each trip is different, a new adventure. I'm waiting to write it. 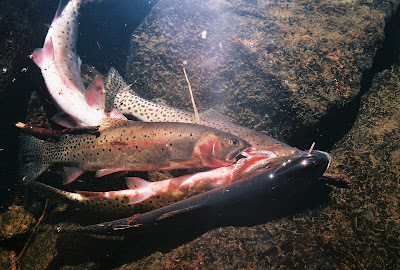 This post was intended to be my entry into the Trout Unlimited writing contest. Who wouldn't want to go to Montana to fish and blog? I believe I have too many unknowns in July to commit to going, but wanted to write the post anyway. I hope you enjoyed it. This is the final post for my efforts for the people at Take Me Fishing. 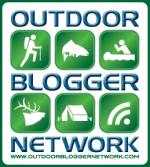 It was a pleasure to blog for them, and I want to thank Rebecca and Joe at the Outdoor Bloggers Network for helping to make these things possible. I have to say, last week was one of my busiest, most hectic work weeks of the year, but to go out for just an hour on Wednesday and catch the biggest brook trout of my life? Very, very satisfying, and definitely worth the effort and lack of dinner. I didn't get to do all that I wanted for National Fishing and Boating Week, but when do we ever? I had to adapt my plan to foul weather conditions as well. I still plan to fish some of the local lakes for bass and panfish this year and video it and share. These lakes are so good, and so beautiful, you have to see it. I ended the week on a good note, with a solo kayak trip on Lake Michigan in search of smallmouth bass and carp. I definitely found the carp, but failed to hook up, and so my bid to add carp to my repertoire continues. It's amazing to fish such clear shallow water for such large fish- it really makes your heart race, every time. I'll head back this weekend for certain, weather permitting. Check out the videos if you like. I feel that I've made my point in this weeks posts. I know that I live a lot closer to a lot more water and fish than most of you, but my point is about taking advantage of opportunity, even if it's just panfish in a local pond. Get out there- it will do you a world of good. Don't let this week go by without at least taking a walk in a park. Take binoculars and try to identify birds. Anything the gets you away from the TV, your computer, your job, your routine. Breathe the air, feel the sun, walk barefoot in the grass. This is our planet, our world, and we damage ourselves by being too busy, by ignoring it. Here's some video of me crossing a small bay to a point with another flat. I spotted schools of carp here as well, but none came in range. The last one is my video thank you to Take Me Fishing, OBN, and all of you. Oh the agony. Another week has arrived. Ready? Me neither. Let's have some coffee. Todays brew is Sumatra Mandheling from Roast & Toast, a local coffee house in Petoskey. It's one of my favorite lunch stops, with fantastic soups and sandwiches in Petoskey's Gaslight District. If you ever make it up this way check it out. The mug is courtesy of Robert Vaughan, fly angler par excellence, the guy who taught me what a loop is. Well, it looks like summer may return after a cold wet rainy week. With all of the repetitive video I shot of overcast days on brook trout streams, it was nice to go out to Lake Michigan yesterday, catch some rays, get the kayak out and look for carp and bass. I found carp right at the launch and didn't get far, but so far I'm still carpless. I got to present my fly to quite a number of fish, but got out too late in the afternoon to sight fish much. While I enjoyed shooting last week, I think I'll enjoy a return to writing and photography for awhile. What a relaxing way to end a busy week. I have one more video post for the people at Take Me Fishing that probably won't be finished until tomorrow. It takes too much time to upload the video. If you haven't heard, Unaccomplished Angler author Kirk Werner has a website called Take Kids Fly Fishing. They are having a coloring contest with some great prizes. If you have children and are wondering how to get them involved with fly fishing, this site is a one stop resource. 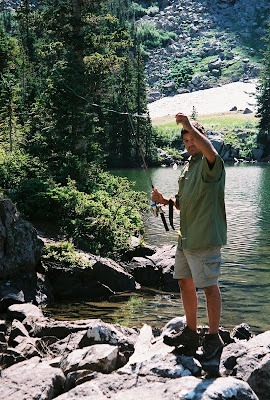 "Take Kids Fly Fishing, which was established to provide a central location where parents and kids can find listings for all manner of gear available for kids, as well as state by state listings of Camps & Classes as well as Kid-Friendly Guides. Our goal is to provide all manner of information to enhance a kid's fly fishing experience, as well as provide a link between manufacturers of kids' gear (etc) and their direct audience. We are officially launching with a coloring contest beginning on June 1st. The contest will run through the month of June and we will be announcing winners during the first week in July. Starting on June 1st Kids can go to our Kids Contest page (http://www.takekidsflyfishing.com/fly-fishin-kids-contest/) to download a coloring page, with instructions on how to submit their work for the contest." Go. Click. Download. Makes me wonder if I qualify as a kid. I still can't color inside the lines. I'm slowly working at making changes to this site, and you may notice I've changed and expanded the blog list to include more of the blogs I follow. There's more that I follow, and more to add to the list, so if you don't see your blog there, don't feel slighted- contact me. 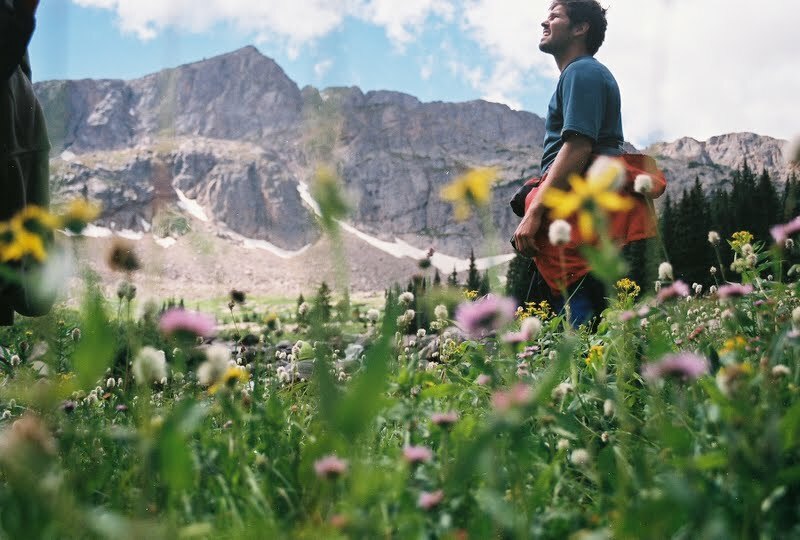 It looks like the Trout Unlimited/ Outdoor Bloggers Network writing contest is heating up. It's a fantastic opportunity for four bloggers to win a trip to Montana to fish the Centennial Valley and blog live onsite. Click over and check out some of the entries on your break sometime this week. The contest ends Thursday, so if you're an OBN blogger and available for the trip you'd better get cracking. Look for this contest to generate some quality posts. Well, it's going to be a busy work week, and it won't get done by itself, so I'd better get going and so had you. Have a great week. I had all of these high hopes for National Fishing and Boating Week. A reasonable work schedule. Lovely summer weather. Flats fishing carp and smallmouth on Lake Michigan, paddling inland lakes for bass and bluegills and pike, a quiet evening on a pothole lake for rainbows, brookies and smallmouth, throwing dries for browns. Instead, I had an arduous work schedule, and it was a cold rainy week. I knew that the topwater bite would be dead on the lakes, and forget about flats fishing. The most productive thing to do was go back for brook trout. So I ventured out with my friend Coyote Luke of the Most Things Custom blog. It will take me some time to get into video editing, so please bear with me. I tried to keep each clip short. Here's the intro. It was quite chilly with temps in the 50's, and we didn't expect much to happen, but wouldn't you know, some BWO's started coming off, and even some sulfurs. Here's our first take on it. We finally decided to match the hatch, and here's what happened. Here's Luke's second fish of the day. My apologies to The Fiberglass Manifesto. I messed around and switched flies a couple times, but finally came up with a fish myself. As the day wore on, the temperature started to drop. Bug and fish activity all but ceased. It was a great outing for exploring water I used to know intimately. A lot of beaver activity has been eliminated, entire holes are gone, and new ones formed. You can see the effects of extreme high water everywhere. We walked back through the woods in the general direction of the truck. Here's what happened next. OK, so it's low brow comedy. Luke is one of the most hilarious people you can spend a day with on the water. Get him and my brother (his best buddy) together and it goes downhill from there. Part of what I tried to capture in this post is the camaraderie that develops when you spend time outdoors. It can be hard at first to be "yourself" on camera, but with enough time you relax and have fun. I hope everyone had this much fun getting out on the water this week. In my continued quest for fish for TakeMeFishing.org and National Fishing and Boating Week, I did not move on to the next water or the next fish. No, I went right back to where I was the other night for more brook trout. I had gotten off work a little earlier and wanted to see if I could actually catch one on camera. To be honest, I haven't fished there in awhile and had forgotten how addictive small stream brook trout are. Here's the intro I filmed with the Flipcam. We had severe thunderstorms all day, and so I didn't expect much to happen. I started out using a stimulator fly, but later switched over to a Chernobyl pattern that has worked well in the past. On days like this you won't move a lot of fish, but the ones that do are usually pretty nice. Here's a video of me yakking and casting. Not much action, but the framing was nice, and it might be worth a look. If you're pressed for time maybe skip this one. If your name is Robert Vaughan, please don't weep at my casting. I'm sorry. You did your best. After a couple more moves and takes I set up the Flipcam and did my usual spiel. What happened next really floored me. Check it out. This is the first week I have ever taken a video camera with me fishing. To actually have the largest brook trout of my life hit, on camera, and successfully land it, was amazing. But to have the camera batteries die at that moment? Priceless. Perhaps it's for the better that you don't get to see me ranting and waving this big fish around. Either way it doesn't matter- it was one of the most sublime moments of my life. I would have taken more still photos, but I had already spent a bunch of time talking to a dead camera and wanted to get him back into the river. Here's some photo's, of my BEST fontinalis ever. If you're new to fishing or haven't fished for brook trout, a 16 inch brook trout is a big deal. It may not sound big, but the average brookie, especially in small streams, is about 6-8 inches. Ten is a nice fish, 12" is big, 14" rare and makes your season- 16 inches, in a small stream? Lifetime. It's roughly equivalent to a 24 inch brown. There's bigger fish out there, but not many, and there's only a handful of areas, usually remote, such as Labrador, northern Quebec and Ontario that regularly produce fish bigger than that. Thus my excitement. I'm very happy to share with you, TakeMeFishing.org, and the blogging underbelly ; ) what was for me a very exciting moment, one that may take years to repeat here. It's still National Fishing and Boating Week, free fishing days are coming up this weekend in a lot of states including Michigan, so get out there. As you can see, you never know what will happen.